Pity I didn't know about this, I think I chucked mine away, the tank went to the tip! I'll look in the garages and shed in case I might have kept it, but I used the excel one instead. Try Lotus bits - they may have one..... Mat. I thought I was being quite polite(?) I'd vote for locking it as it appears to be a bit "troll-esque" if that's a word, but not deletion. In fact this is the only line I've found even remotely offensive: "there are twelve year old children with greater debating acumen and decorum." Mat. well obviously run it in first(!) IMO - engines should be "thrashable" within tolerances, ie temps and oil changes, max revs respected regular service and fluid changes etc. But they should be robust enough to take heavy use to the boundary of their performance subject to service intervals. you shouldn't have to "baby" them. Get a modern Ford/BMW/Audi for example and you can thrash it for a very long time before something breaks. Or my Honda fireblade - thrashed as often as possible, unbreakable...... The Honda fireblade engine is therefore a good one in my book. That is the same logic that took me to the Toyota 1UZ engine for my car - cost me £400 inc electrics and ancillaries. 260-280 bhp as standard. People run them at 500-800 bhp and they are still very reliable. And it's non-interference. People can slag off putting a V8 in if they want, but if it does break, a replacement is about £400 on ebay. Also does about 30mpg in a light car. In fact i currently have a non MOT but running Toyota Soarer that cost me £350, I'm planning to break it, keep the engine and a few other bits as spares then sell the rest of it to get my money back so it will be free spares. I considered a second hand or rebuilt 907 or 912 engine, too expensive, too risky and less power than a 1uz. So I can thrash the car as much as I want without worry. To me if an engine is fragile that's not a good thing.... I know it's Chapmans creed that a race car should fall to pieces as it crosses the line or it's too well built and therefore too heavy. But for a road car this doesn't follow for me. And if you're a relative of Jim Clark it probably doesn't sit well either. I just daren't go on the Soarer forum and hear about how I've sacrificed a perfectly good Soarer V8 to put the engine in a rubbish old Lotus. Mat. The "f" in any such phrases is deliberately ambiguous, it can stand for: flip, frick, frigg etc, the inference is by the reader and the context. So no actual swear word has been said or stated, merely inferred by the reader. I don't see why Mark has to justify his comment, he's not the only moderator, if others see it as unacceptable it would have been removed. See you on the excel.net forum! I like that forum and there are some good people on there. I can't use it at work because it is blocked by my work browser as it has a rude word in the title. Otherwise I would probably go on there more often. Mat. Brian, tell us what to do oh great leader..... Why don't you all just f*** off and leave me alone!!!! How shall we f*** off my lord??? ha ha - it will come out over the dinner table. "Mommy why can't we go in Dad's blue Lotus?" wood backing for S2 rear lights? Hi all, This has been on my "to do" list for ages - On removal of the rear bumper, I found two pieces of wood behind the rear lights, between the rear lights and the bumper. My car is an S1 but someone has retro fitted an S2 rear bumper and light units. So I'm not sure if this is original or not - can anyone with an S2 elite or eclat tell me if their car has this? If not, what should be there? On mine (needless to say) they have started to fall to bits, so assuming these should be there, I'll get my local DIY shop to cut me two new pieces from marine ply, and coat them with fibreglass resin as I did with the crash structure boards at the front. Thanks, Mat. Hi Dunc, Interesting review, I drove a friends early excel, I found it more "solid" feeling, and a bit more "modern" but to me it felt better to drive than my S1. I much prefer the styling on the eclat to the excel, which looks a bit "Toyota" to me, where the eclat looks more like an old British sports car, but that's just my personal preference. My car project would have been way simpler if I'd started with an excel, but I had got really attached to the eclat so went with the chassis conversion. But I guess if you prefer the eclat that's the one you should keep. Well done for getting that excel back on the road though. When you've done 10,000 miles in each of them and you have to change the rear brakes (and UJs on the eclat) you may change your mind ha ha! Mat. 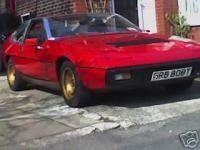 Just for info: http://www.ebay.co.uk/itm/Lotus-since-the-70s-Vol-1-Elite-Eclat-Excel-Elan-by-Robson-Collectors-Guide-/111479097686?pt=UK_CarParts_Vehicles_Manuals_Litterature_ET&hash=item19f4ac0956 Mat. Btw I was looking through my documents on the computer, and found the Lotusbits "improving your elite" PDF. In there is a photo of Mike Taylors own yellow elite, which has the waist trim removed..... It reminded me of this thread. I can't see it being an issue until people start saying "I removed my waist trim and now may car has split in half", I'm sure the trim is a cost thing from Lotus, much cheaper to tidy the join line with a rubber trim than grinding, reshaping and refinishing the outside of the car. Mat. Wanted: Complete interior for a '75 ELITE. And someone on ebay saying the L stamped wheelnuts were worth £25 each!! !